Gardening is becoming very popular these days. Many homeowners use a part of their property to plant a favorite shrub, a patch of flowers to attract birds, a small vegetable garden and even a popular tree. Jim and Kathy McMahon have taken this to an extreme. The entire property at 15 King John Drive is now landscaped with flowering shrubs and trees surrounded with perennials and annuals that offer guests and visitors to Tiffany Gardens a peaceful retreat. Stone walls, wooden structures, water features and lawn paths are placed to make each garden room separate and unique. One garden club wrote “it has more rooms than the Ritz”. 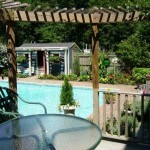 Visiting guests find the gardens and accommodations very peaceful and relaxing. Even the local wildlife finds it inviting. Honey bees from Londonderry’s numerous apple orchards fly more than a mile to collect flower pollen from the diverse selection of plants selected from nurseries all over the US or grown from seed. Most shrubs and trees are labeled for identification. Gardens tours are given annually and to passerby’s who can’t resist a short visit to see what is in bloom on any given day. The garden’s guests inspired the property owners to make the grounds available for longer periods by registering the property as a Bed and Breakfast and advertising on websites. 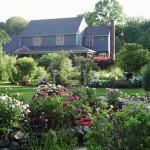 The two-room, private bath B&B now has guests every month of the year and for any special occasion. A full breakfast is served daily with guest-requested menus or with surprise offerings from the B&B kitchen. 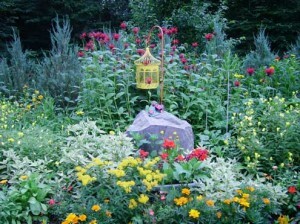 Visit the gardens at 15 King John Drive, Londonderry. Browse this Google Map for more detailed directions. Also, visit the Tiffany Gardens site to book a stay!